News: architecture firm Kohn Pedersen Fox has submitted plans to add 11 floors on top of an existing 30-storey tower in London. The project engineer claims this would be the first time such an ambitious extension has been attempted. Architect Kohn Pedersen Fox (KPF) and engineers Adams Kara Taylor (AKT II) have applied to Southwark Council to extend the 111 metre-high King's Reach Tower on London's South Bank by an additional 44 metres. Approval already exists to add six extra floors but AKT II claimed that extending a legacy tower by a third was a world first: "This has never been done before," founding director Albert Taylor told Building Design. 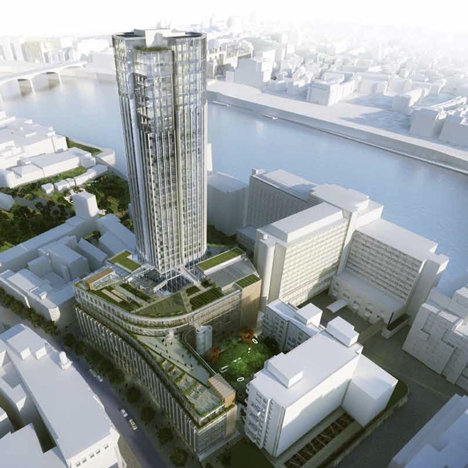 Southwark planners will meet next Tuesday to consider the plans, which will take the tower to 155 metres. The 111 metre-high tower, now rebranded as South Bank Tower, was designed by architect Richard Seifert and completed in 1978. An extensive refurbishment scheme to convert the building into a mix of retail, office and residential spaces was approved in October 2011 and will include 173 luxury apartments from floor 11 upwards. The extended tower would form part of a new cluster of tall buildings on the southern bank of the River Thames, which includes the newly completed Shard by Renzo Piano and the forthcoming One Blackfriars by Ian Simpson Architects.